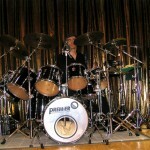 Bob plays a non- standard Premier kit with Sabian and Zildjian cymbals, amassed as individual items over the last 20 years. This replaces an earlier kit (a 1979 vintage Premier Olympic 5 drum outfit with Zyn cymbals), which is still going strong with Bob’s younger brother, Peter. The kit is built around a 20″ x 18″ Projector bass drum (small enough for easy transport, but deep enough for driving rock) and a trusty Project One snare. A collection of 6 tom-toms, which provide great flexibility for varying set-ups, include: Projector 8’’ x 8’’, 10’’ x 8’’, 12″ x 10’’ & 14’’ x 12’’ with Cabria 16’’ x 13’’ & 18’’ x 16’’. All the drums are finished in their original solid black and despite being acquired over many years, they blend excellently, both musically and visually. 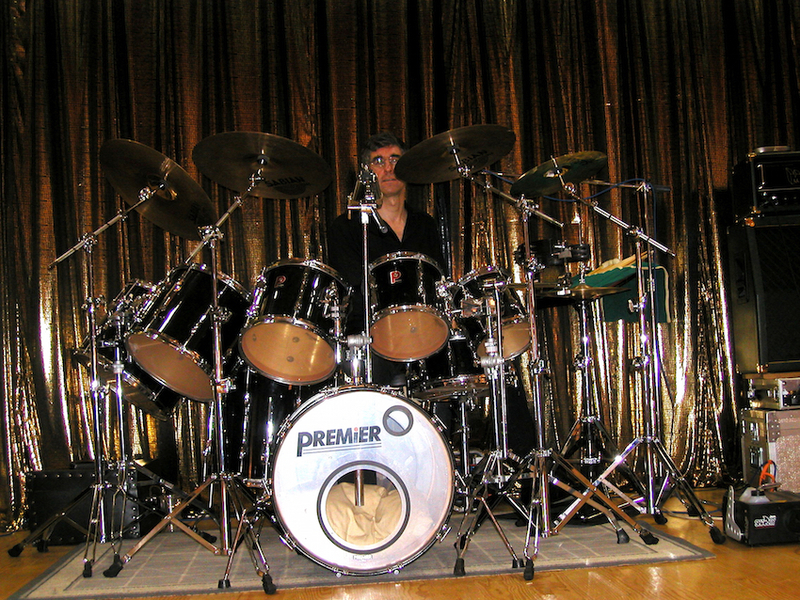 The original Premier hardware is now being gradually retired to the rehearsal studio and replaced with sturdy Premier 6000 series double-braced stands. The collection of Sabianand Zildjian cymbals still sound and look great after nearly 20 years of gigging. A recently acquired 14’’ Sabian HH thin crash blends in with 14’’ Zildjian K hi-hats, 16’’ & 18’’ Sabian HHthin crashes and a Sabian 20’’ heavy ride. It all adds up to a very versatile outfit to provide everything from soft ballad accompaniment to driving, power house rock.